NEET PG Counselling 2019: The National Testing Agency has announced the counselling dates. The Counselling Round of NEET PG 2019 has been started. You can check the schedule down below. The Seat Matrix for second round counselling has been started. However, The NEET PG First Round of Counselling was started from 15th March 2019. 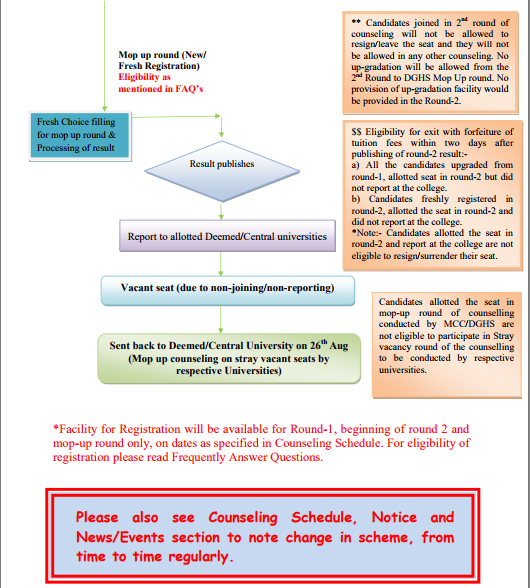 The NEET 2019 First Round Counselling will close on 24th March 2019. The All India NEET 2019 PG Counselling for Round II is open now. We have provided the link, where you can apply. We have provided all the dates here. NEET PG 2019 appeared and qualified candidates get admission into PG courses like Master of Science (MS), Doctor of Medicine (MD), and PG Diploma Courses. On behalf of the Medical Counselling Committee (MCC), Directorate General of Health Services (DGHS) conducts the NEET PG Counselling 2019. The Counselling Process is conducted by the Medical Counselling Committee. The official website is www.mcc.nic.in NEET PG 2019 qualified candidate need to register for participating in the NEET PG Counselling 2019 procedure. NEET PG Counselling 2019 is likely to start from 2nd week of March 2019. 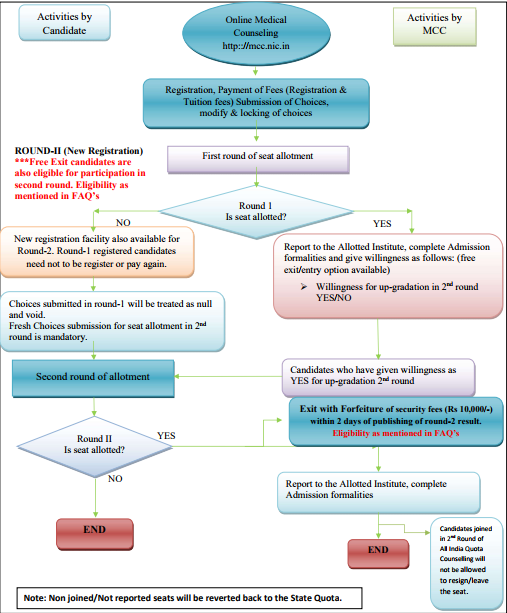 To know the NEET PG 2019 detailed process, schedule, seat matrix, seat allotment, FAQs etc, the candidate must go through this article. National Board of Examination (NBE) conduct the NEET PG exam in online mode every year in the month of January. In 2019, NEET PG took place on 6th January. NEET PG 2019 result was released in the third week of January 2019. Now, the MCC NEET PG 2019 Counselling is going. 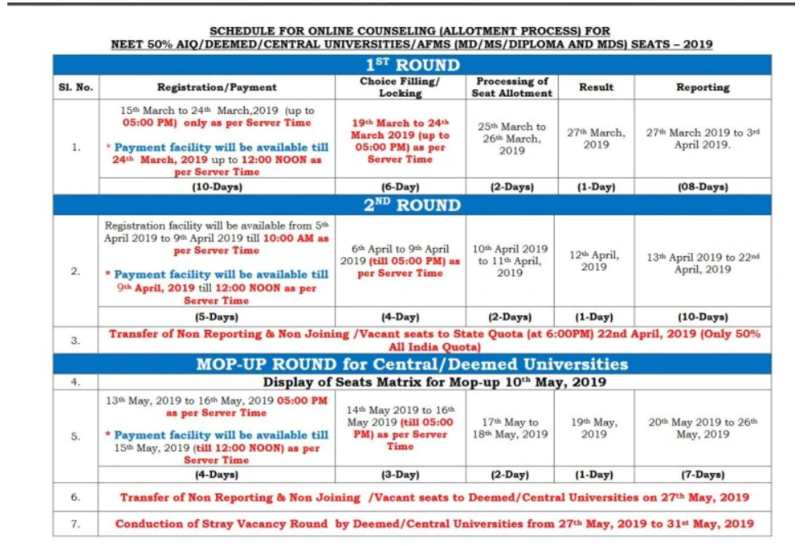 NEET PG 2019 Counselling: This counselling process is the centralised process which is conducted for admission to 50% All India Quota seats, Central and Deemed Universities, and AFMS Institutions. The counselling of NEET PG 2019 for 50% All India Quota seats will be conducted in two rounds while the counselling for Central & Deemed Universities will be conducted in three rounds. NEET PG 2019 counselling will be merit-based which means the counselling will be conducted on the basis of the NEET-PG score. Candidate will be granted admission based on counselling participation and marks obtained. To participate in the NEET PG 2019 counselling – (link will be updated shortly). NEET PG 2019 Counselling: Here we have provided the dates of All India NEET PG Counselling 2019. Thus, check all the dates of the NEET 2019 Counselling of PG. 1. All India 50% quota Medical Educational Institutions of Central Govt. Universities established by an Act of Parliament Deemed Universities. Directorate General of Health Services, Ministry of Health & Family Welfare, Govt. of India. 2. State quota seats in All Medical Institutions in a State and seats in institutions established by State Govt., Universities established by Act of State/Union Territory Legislature, Municipal Bodies Trust, Society, Company or Minority Institutions State Government or authority designated by the State Government. Candidates must take and qualify the NEET PG 2019 exam in order to become eligible for participating in the NEET PG counselling process. NEET PG 2019 minimum qualifying marks required for different categories are provided below. Candidates are advised to check the Minimum Qualifying percentile before registering for counselling. Candidates who have been allotted All India Rank(AIR) are eligible to participate in the NEET PG 2019 counselling procedure. The Applicants belonging to the state of Jammu and Kashmir are not eligible for the counselling of 50% All India Quota seats. Thus, the candidates need to register themselves in order to participate in the NEET PG Counselling 2019. The seats available under Central Universities Internal Quota will be available for those candidates only who have completed MBBS degree from the respective Central University. Medical Counselling Committee (MCC) will be responsible to conduct 50% All India Quota(AIQ) seats. State counselling authority shall be responsible to conduct the respective state counselling. The state or union territory’s counselling conducting bodies will be releasing their separate merit list using the NEET PG merit list. Two main rounds and one mop round of counselling will be conducted in online mode. The candidates can go for the upgradation if they want. Candidates will have to register new for Mop-Up Round. Eligible candidate needs to register themselves for the NEET PG 2019 counselling. In this step, they need to submit general details like the stream (Medical/Dental), NEET PG roll no., application no., candidate’s name, birth date, security pin etc and click on ‘Submit’ button. After entering the details, they need to click on “I agree” option. Login Id and password will be reflected on the screen. Candidates will now be asked to take a note of the login credentials and the password which should be protected with a security question. In this step of NEET PG 2019 Counselling, candidates will be required to submit general details like name, qualification, corresponding address and identity proof details. Click on ‘Submit’ button. It must be noted that these details cannot be changed by the candidates afterwards, therefore, the information provided should be similar to the documents candidates will submit at the time of admission. Candidates will be required to pay the non-refundable registration fee and refundable tuition fee in online mode. The fees can only be paid via the online medium like Credit/Card/Debit Card/Net Banking. Here we have provided the NEET PG 2019 counselling registration fee for different categories in Indian rupees. NEET PG 2019 tuition fee is also provided in the table below. NOTE: NEET PG 2019 counseling fee is non-refundable and the tuition fee is refundable. After the counselling and tuition fee payment, candidates need to select the choice of their universities from the available options. The ‘Available Choices’ link is available once the counselling process starts. On the left side of the screen, the available choices will be displayed on the screen. Candidates who will submit the fees for both 50% AIQ/Central Universities and Deemed Universities will be eligible to apply for both the category of seats. NOTE: Candidates are advised to carefully select the universities in the preferred order and lock it. Once the choices are locked, the choices cannot be edited later. How to select the Universities of your choice? Candidates need to click on the ‘+’ button to add on their preferred university list. Click on “-” to remove the selected university from the list. As the candidates select a particular preference, the choices will be transferred from the left-hand side of the screen to the right-hand side. After selecting choices, candidates will be asked to click on ‘Save & Continue’ button to save and continue with the process or ‘Save & Go to Home Page’ button to save the options and exit. Aspirants can also click on a selected choice and drag it to a particular choice interchange the choices. The next step after choice filling and locking is taking the printout of the list of selected universities. Take the printout after the final submission. NEET PG 2019 Counselling: The Medical Council of India (MCI)is the main conducting body for Post Graduate Counselling for NEET 2019. Accordingly, the fee forfeiture rule will be applicable. The candidates are required to submit the refundable and non-refundable fee while registering for the first time. 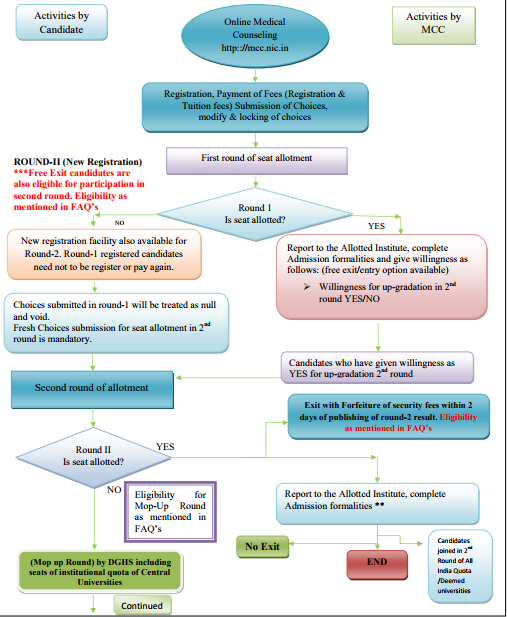 In the first round of counselling, candidates will be given free exit meaning the refundable fees will be returned to the candidate if the seat is allotted or not allotted to the candidates and they can also participate in the next round of All India mcc.nic.in NEET PG 2019 counselling. NEET PG 2019 Counselling: The MCC, official counselling authority shall be releasing the seat matrix after each round of counselling is concluded. The seat matrix for the round one will reflect the total number of seats available in NEET PG 2019 counselling. DGHS will be releasing the separate seat matrix of 50% All India Quota, Deemed and Central Universities. The seat matrix will display the category-wise seats available in each specialisation offered by a respective college. After each NEET PG 2019 Counselling round, DGHS, the official NEET PG 2019 Counselling authority, shall be releasing seat allotment result. Candidates need to download the seat allotment letter and report to the official authority. The seat allotment list will contain details like All India Rank, Allotted Quota, Category and Institute, Course, Candidate Category and Remarks. After this, the authority will publish the seat matrix. Vacant Seats available along with the corresponding category in the participating institute after each round will be published. This is the final step in the counseling. Candidate needs to report to the designated document verification centre at the time of admission. 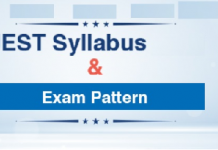 At the time of NEET PG 2019 registration, the candidate needs to enter the details as mentioned on their admit card or application form. At the time of reporting, the candidate needs to carry the below-mentioned documents in original form. One xerox copy of all the same also needs to be carried at the time of admission. The NEET PG 2019 counselling for remaining 50% State Quota seats (100% in case of Jammu and Kashmir) in government medical colleges and all the seats of self-financing and private colleges will be conducted by the respective state counselling authorities. The states will be conducting the common centralised counselling for MD/MS/PG Diploma courses. The states will be releasing their own merit list and counselling schedule for NEET PG 2019 state counselling. The state merit list will be available on the basis of NEET PG merit list 2019. Q. If a candidate is not allotted any seat in any of the rounds of NEET PG 2019 Counselling, then will the counselling fees be refunded? Ans: Candidates will be submitting two types of fees at the time of registration- Non-Refundable Registration Fee and Refundable Tuition Fee. The Non-Refundable Registration Fee suggests that fees will not be refunded back. Whereas, the Candidates will get back the tuition fees, if they are not allotted a seat in any of the rounds of counselling or they are allotted a seat in the round one of counselling but do not join the allotted college. Q. 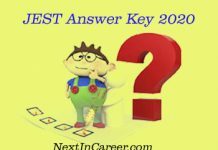 What is Confirmation Number in NEET PG 2019 Counseling? 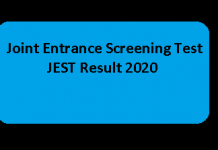 Ans: The NEET PG Confirmation Number is for confirming the Roll Number of NEET PG 2019. The Confirmation Number is located at the top section the NEET PG Admit Card 2019. Q. How many choices can be submitted at the time of NEET PG counselling 2019? Ans: Candidates can submit any number of choices as they wish. It must be ensured by the candidates that the choices submitted are in order of preference. Q. Do I have to report to a particular center in order to participate in the counselling process of NEET PG 2019? Ans: The NEET PG 2019 Counselling process (registration, choice filling and choice locking) is completely online. Candidates can participate in the counselling 2019 from any place of convenience where they have access to a good internet connection. Q. If a candidate does not submit choices then will he/she get allotted any seat? Ans: In order to obtain a seat, the candidates must register for the counselling process, submit preferences and save them. Candidates must lock their final choices. However, if the candidates do not lock their choices then the saved choices will be considered final. Candidates who will not register or those who will not submit any choices will not be considered at the time of NEET PG seat allotment. Q. Does the candidate require to fill fresh choices to participate in the second round of Counselling? Ans: Yes, candidates will be required to fresh choices if, they haven’t participated in the first round of the Counselling, they have not been allotted seat in the round one of counselling, or they have not reported at the allotted college in round one and have registered fresh choices for round two. Candidates who will be allotted seat in the first round of counselling and will opt for upgradation will not be required to submit fresh choices. The higher preference will be considered in such case. Q. If a candidate is not allotted any seat in the second round of counseling then will the seat allotted in the first round of counseling will be considered canceled? Ans: The seat allotted in the round one of NEET PG 2019 Counselling will be retained if a seat is not allotted in the second round of counselling considering candidate has completed the admission formalities or not resigned from the earlier allotted seat. If you have any doubt related to NEET PG 2019 Counselling and Seat Allotment, please feel free to write in the comment box given below. 9 How to select the Universities of your choice?